Aljazeera documentary, 25 minutes long, about mining frenzy in Sápmi. The circle is a symbol for both the sun and the moon. The sun circle is red and the moon circle is blue. 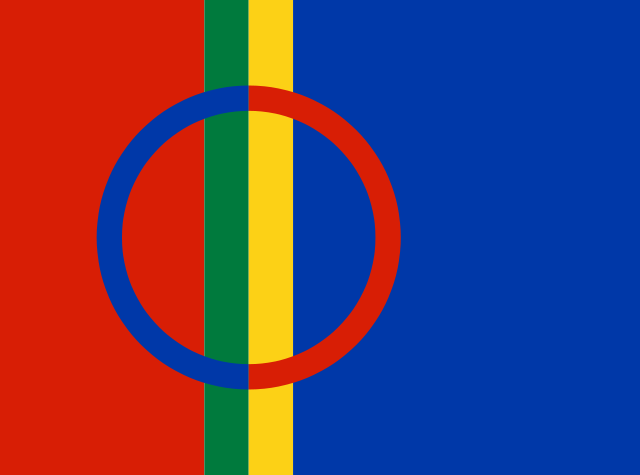 The flag’s colors – red, blue, green and yellow – are the same as in the traditional Sami costume, the “kolt”. The colors are symbols for things that are important for survival, red for fire, green for plants and nature, yellow for the sun and blue for water. Gidá Spring Late April to late May. VisitSápmi is the Sámi initiative to organize and promote sustainable and ethic Sámi tourism. Reindeer herders: Saami, the indigenous peoples of the Arctic Circle – Reindeer in my Saami Heart documents the lives of the Saami people who inhabit the land in Sweden’s Arctic Circle. Sami Parliaments: The Scandinavian Model – What would a First Nation Voice to parliament look like? Yoiking with Ánde Somby – Yoiking, which comes from the Sami people of northern Europe, is one of the oldest musical traditions in the world. Having a yoik is as important as having a name. Northern Lives – If the Arctic is considered the world’s barometer for measuring climate change, then the Sami are at its mercury. Today we travel to the Norwegian Arctic to meet with a group of reindeer herders who are worried their traditional knowledge might not be enough to survive the changing climate. Mari Boine: Sami singer – Norwegian by birth, Mari Boine sings the traditional yoiks of her Sami homeland. Visiting Australia for Womadelaide, she talks toThe Music Show about Sami land rights and culture. The winner of the judged 2010 ITBW Award is Nutti Sami Siida, which arranges nature and culture tours based on the Sámi culture. Owners Nils Torbjörn Nutti and Carina Pingi are from Saarivuoma and Gabna Sámi comunities (Sameby), Sweden. To leave things in nature as they are for others to experience is the philosophy of this tour company, who operate in the sensitive Arctic region. The owners make their living showing guests what is considered to be wilderness, which is their back yard, and strive to keep it intact for generations to come. Nutti Sámi Siida encourages visitors to take their time to enjoy their discoveries – from watching a moose hiding among the birches, to learning about a new plant – rather than simply putting miles behind them. Nature is one of the reasons that travelers choose this area, so tours are offered at a slower pace to explore this great landscape. Experiences include reindeer sled trips, trekking, Sámi culture, a museum with nomadic artifacts, and a handicrafts shop. As the Sámi people have become more settled in recent years, their nomadic traditions have stopped. The only way to keep the traditional knowledge alive is to practice it, and Nutti Sámi Siida does so very effectively by conducting trips. They place a high value on educating visitors by introducing them to the local culture and traditional skills. Guides carefully chosen for their close connection with reindeer herding and Sámi culture offer authentic experiences, and teach guests about both the historic and present day way of life. Working with responsible and sustainable tourism is very natural for these indigenous peoples who have populated an area for thousands of years without leaving obvious traces in nature. Nutti Sámi Siida was one of the first companies with products approved by Nature’s Best, a Swedish quality certification for ecotourism. Muohta & ritni & vahca are only three of hundreds of terms for snow in Sámi language.